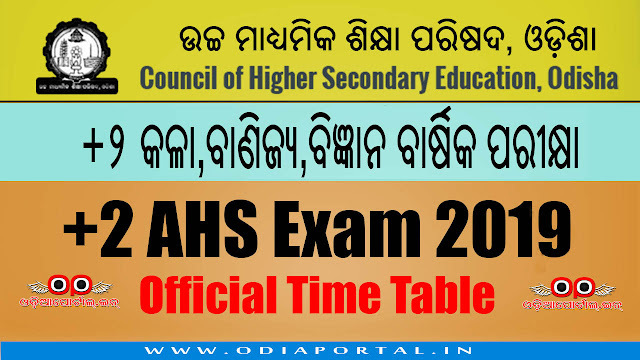 Council of Higher Secondary Education (CHSE), Odisha has published Programme for Annual HS Examination 2019 for Arts, Commerce Science, Vocational and Distance Education streams. You can check complete Examination Time Table or Schedule below. Also, you can save as PDF. NOTE: Biology (Reg) 3 Hours 15 Minutes (Section-A Botany 10.00 am to 11.30 am // Section-B Zoology 11.30am to 1.15 pm (The duration of Biology (Reg) has been modified vide Notification No. 7994 CHSE,dt. 19.12.17 Biology-I. (Botany) (Ex-Reg) 2 Hours Duration.